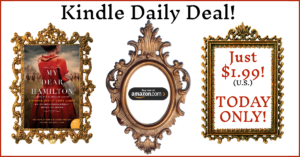 Aug17 Comments Off on My Dear Hamilton is the Kindle Daily Deal! Friends! MY DEAR HAMILTON is on sale for just $1.99 – TODAY ONLY! This is an Amazon U.S. sale, but fingers crossed that other retailers or non-U.S. match. Let us know if you get or gift your copy! And shares would be so appreciated! Get Eliza’s story as it’s never been told before! Thanks for reading! Let us know if you get your copy!